Today I learned how to use a rice cooker. My life is now infinitely easier. 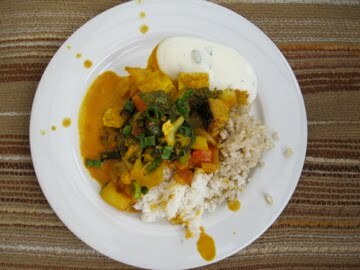 Today I made curry for 60 people without using a recipe, I just chopped, sauteed, poured, and stirred. Somehow everything turned out great. Now that the sun stays out later, I can take pretty pictures of my Tuesday night co-op dinners in nice daylight. 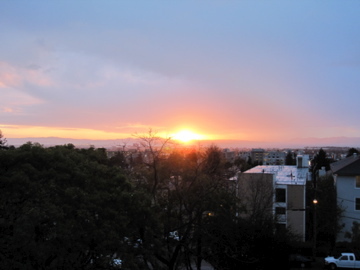 I can enjoy a nice meal outside on the beautiful porch with beautiful people and the most amazing view of the Bay Area. So back to curry. I have eaten many types of curry in my day, however I still feel pretty clueless about all the different kinds and what they each entail. There is Thai curry, Indian curry, red curry, yellow curry, green curry…and all have specific names that I have trouble remembering and pronouncing (maybe Mexican mole sauce falls into this “curry-like” category?). 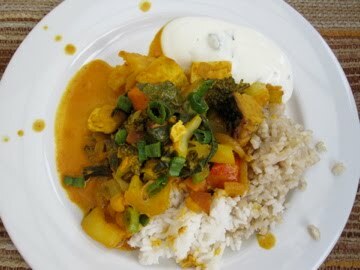 From my experience, curries are usually stew-like, thick yet liquidy and eaten with rice or some form of bread. There is a variety of spices and flavors used. The curry that I made today was spiced with fresh ginger and garlic, tumeric, cumin, coriander, cayenne, curry powder, and cinnamon sticks. All of these spices gave the curry a nice yellow/orange color. I threw in a TON of vegetables: sweet potatoes, onions, bok choy, bell peppers, broccoli, cauliflower, roasted Kabocha squash, scallions…I also threw in garbanzo beans and fried up some tofu and tempeh to add to the mix. The liquid was a combination of coconut milk, tomato sauce, water, vegetable broth, and lemon juice. To wash it all down, my cooking assistant David made some freakin’ chai-licious chai tea drinks. Well done, David. 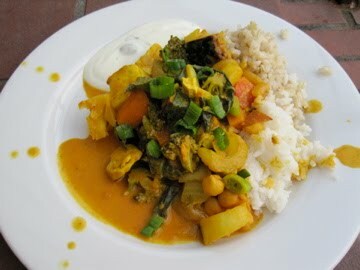 In my opinion, this curry felt really hearty but very “light” at the same time. I did not use cream or butter (ok fine I did still use some oil and coconut milk…), and the curry is mostly made of vegetables. I love all the different textures and colors, and I love that this can be made for just a few or for a bazillion people. It is also nice because once all of the vegetables are prepped, the curry just simmers and there is no need to exert a lot of physical energy to cook it. Carrying the HUGE pot to the table is the hardest part. Here is a rough recipe for the curry (you can subsitute any vegetables/fruits that you like and you can also add meat if you choose). 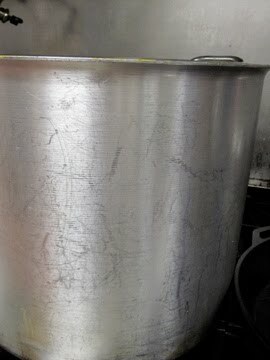 Honestly, I just threw in a pinch of this and a squeeze of that…after cooking such large batches of food for so many meals, I feel fairly confident when I do not use exact measurements. The palm of my hand is a sufficient measuring device. 1. Sautee the onions and spices in oil. Cover the onions and let them “sweat” aka until the onions start to soften and become fragrant (about 5-8 minutes). Add the garlic and ginger and cook for 1 minute more. 2. Stir and add the peppers and potatoes. 3. Add the coconut milk, tomato sauce, and veggie broth. 4. Add water if it gets too thick. Just eyeball it, no need for exact measurements. 5. Let everything simmer for a while until the potatoes are tender (may take about 20 minutes). 6. While the curry is simmering, heat pan with a thin layer of canola oil until super hot. Add the tempeh and tofu and fry on each side until golden. 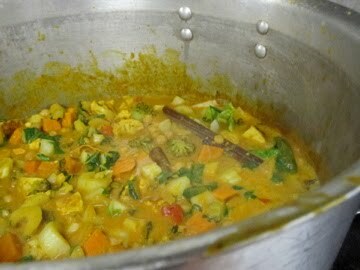 Add this to the simmering curry. 7. Add the garbanzo beans to the curry. 8. Taste and add some lime/lemon juice, zest, and cilantro or scallions. 10. Enjoy over rice or with naan bread! Combine everything into a bowl and serve with curry and rice/naan. >Thanks Kat, you should definitely try this recipe. Just add whatever vegetables you like/have on hand. Let me know how it turns out.